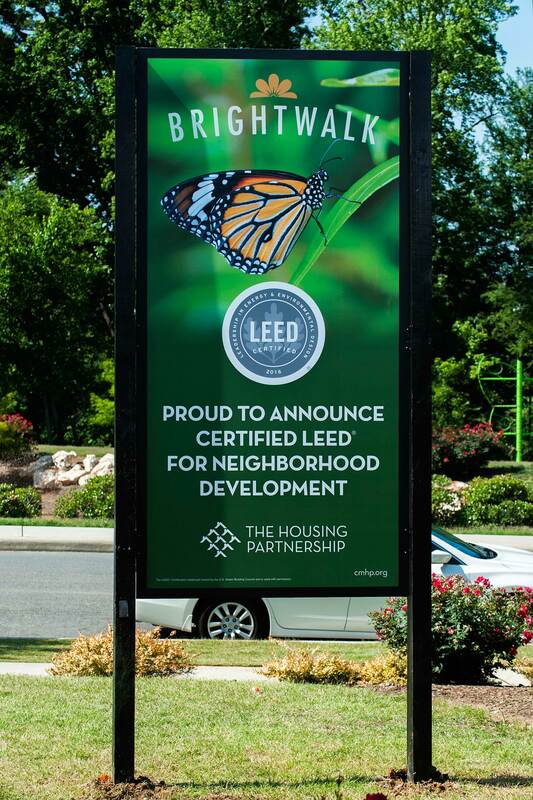 The Brightwalk community was recently certified LEED for Neighborhood Development (LEED-ND); it’s the first and largest project in North Carolina to receive this designation outside of the LEED-ND pilot program, which was launched in 2010. 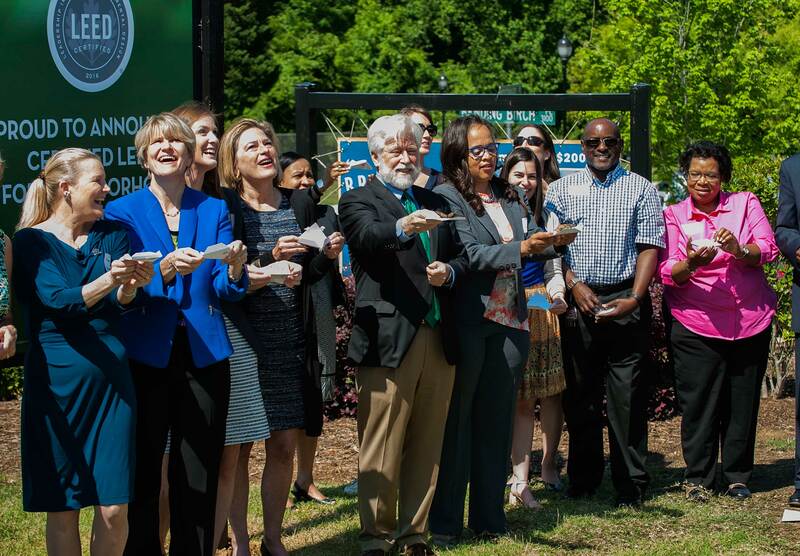 On Tuesday, the community unveiled its new sign at a green celebration, which highlighted the project’s milestones met to date, the partnerships instrumental to its development and the residents and the community members themselves. Brightwalk, which describes itself as an “environment for those who care about the environment,” received an Affordable Neighborhood Grant from USGBC, funded by the Bank of America Charitable Foundation, and features a variety of residential space types. 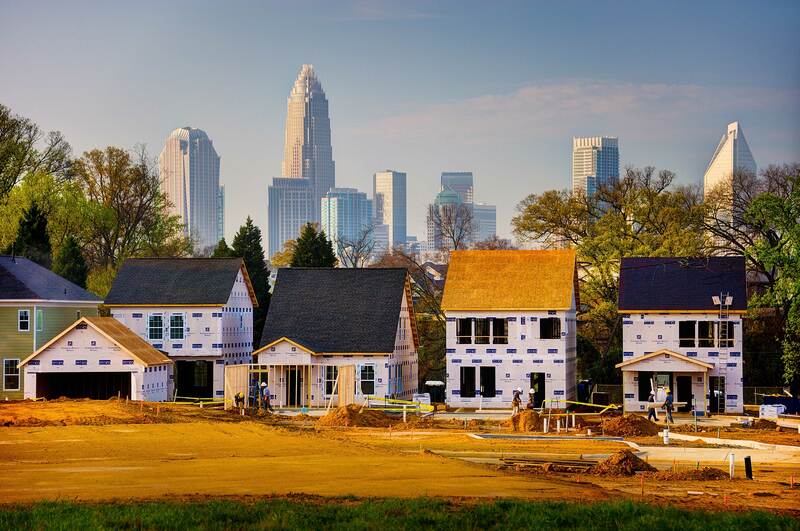 It is owned by Charlotte Mecklenburg Housing Partnership, which aims to expand affordable housing and promote stable neighborhoods, providing assistance to residents to more fully enter the economic mainstream and achieve independence. Seventy acres of the Brightwalk community qualified for certification through practical and measurable strategies that achieved above-baseline performance in location and linkage, neighborhood pattern and design, innovation in design and regional priority. The walkable community is in proximity to public transportation, with bicycle lanes that connect to Charlotte’s Center City—a major bonus in a city that is largely dependent on cars. Efforts to ensure site sustainability included preservation of natural habitat and space, stream restoration with native plants and brownfield remediation. Releasing butterflies at the opening ceremony. Fostering a distinct and welcoming communal identity also was factored into the neighborhood’s design. Brightwalk’s affordable housing for seniors and working families reflects a diverse range of economic levels, household sizes and age groups. The project also received a 2013 ArtPlace grant through the McColl Center for Art+ Innovation and currently features seven installations of environmental art. Located in the Brightwalk community is the home of Stefanie Young, director of technical solutions at USGBC. Young is one of the first on USGBC’s national staff to certify and live in a LEED single-family home. I asked her what it is like to live in this neighborhood and about the process of building her own LEED home. How did you get involved in the Brightwalk community? I knew Brightwalk was an affordable neighborhood grant recipient, and as the former manager of the LEED-ND Pilot Program at USGBC, I was glad to hear of a project being built here in Charlotte with clear sustainable design measures in mind. As soon as I came on site, I knew it was a community I wanted to be a part of and help grow. What were some considerations you worked through before starting to build? As a first-time home buyer, I was admittedly skeptical about taking on too much at once. But after connecting with my builder Standard Pacific (now Ryland Homes) and seeing how they were already building to Energy Star standards, I was determined to take it the next level and verify that my home was efficient and healthy across the board. We had to make sure all the stakeholders involved were committed to seeing the project through. This required a variety of collaborations and unique approaches, but in the end was very successful. What surprised you most about the process of building a LEED Home? More education and awareness is needed! Working closely with my Provider and Green Rater, I helped coordinate some of the submittals and verifications with the builder and their subcontractors. We found that many of their design/build practices, materials and home efficiency measures were already in alignment with LEED requirements or only needed a few modifications. Helping them understand what we were trying to achieve, and how, proved to be very informative to their work. Now, as the homeowner with low utility bills and the assurance that my home is sustainable and a good living environment, I too get to reap the benefits. What do you see as the future of Brightwalk, and other LEED ND projects? The community continues to grow, and it is great to see how we are quickly becoming part of the local urban fabric. Several retailers and other developers are taking notice and creating plans and projects that will make the area even more vibrant and vital to the surrounding neighborhoods. It takes urban pioneers like the Housing Partnership and my fellow residents to make this and other similar LEED-ND projects successful.